Good afternoon, all. This duck report covers both yesterday and today, as I lacked time (and photos) to do a proper one yesterday. 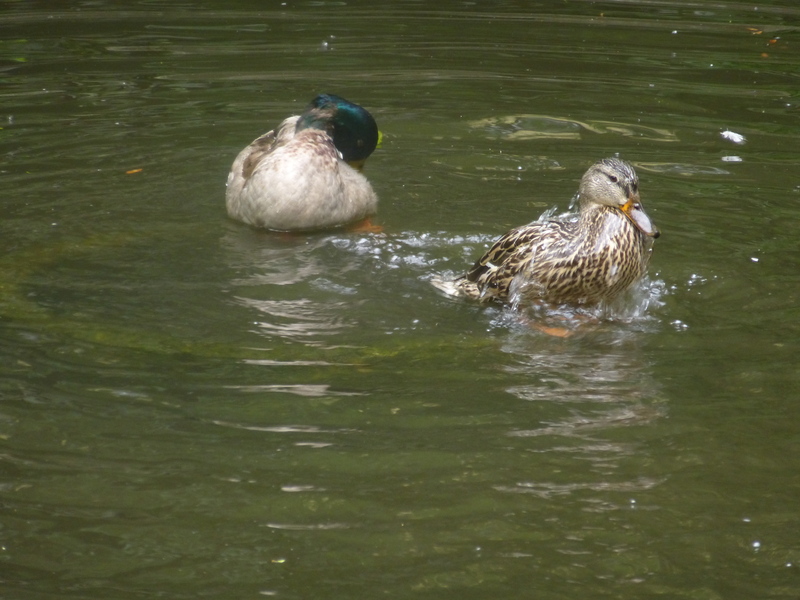 Here’s yesterday’s postprandial bathing. I love this photo as Honey looks as if she’s smiling at her brood (I suggest enlarging it). Yes, there are eight ducklings there. They’re still at the adorable stage, but they’re definitely developing a ducklike profile. 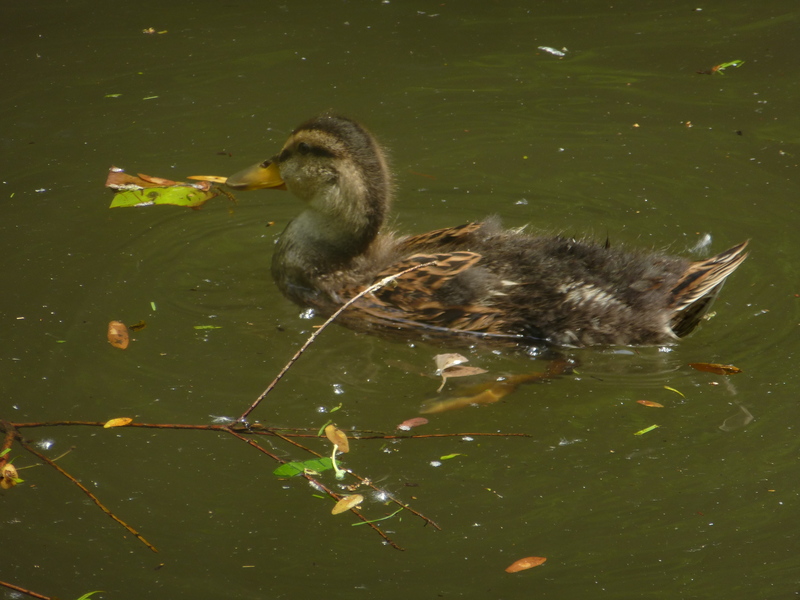 So all is well at Botany Pond, with frequent feedings and happy ducks. Here’s Honey standing guard on Duck Island, watching her brood do their postprandial ablutions after lunch today. This entry was written by whyevolutionistrue and posted on June 15, 2018 at 2:45 pm and filed under ducklings, ducks. Bookmark the permalink. Follow any comments here with the RSS feed for this post. Both comments and trackbacks are currently closed. I think maybe we need to change the name up there to Duck City. I loved Botany Pond when I was a student in the last years of the Hutchins College. Is the great Gingko Tree still there? 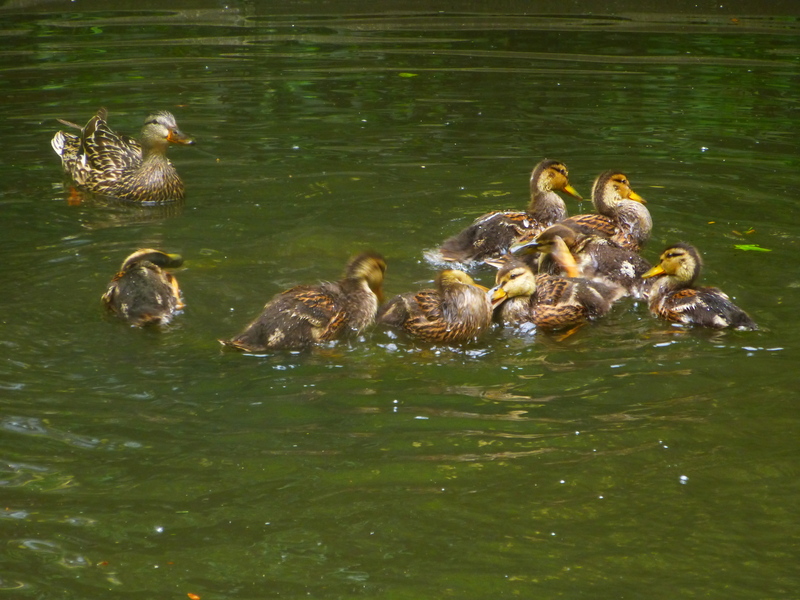 Do you ever go to the Island in the park by the Museum of Science & Industry, with the population of Mallards (like Honey & her ducklings)? The young males are real hot doggers. 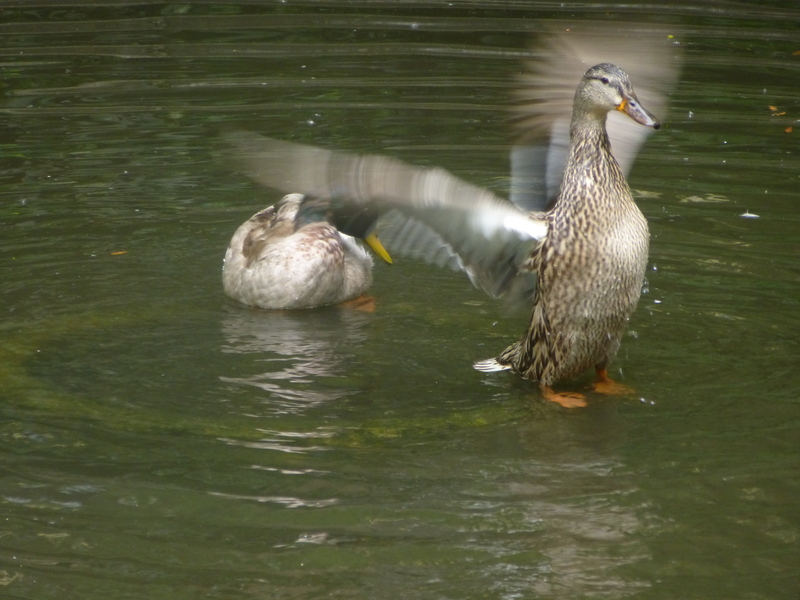 When they land on the pond they throw their feet forward and honk up a storm! They are so funny! Yes, the big gingko is still there, and they put up an awning every year over the sidewalk to keep people from stepping on the stinky gingko fruits. I haven’t been to the island by the MS&I. Are you sure you mean Mallards, because they don’t honk and male mallards don’t really quack much. Hey now, no duck pedophilia please! The University of Chicago posted a great pic of the Main Quad on its instagram account. The top of the picture points west. The street on the west is Ellis. The other streets are 57th (right, north), University (bottom, east), 59th (left, south). The opening in the middle of the Main Quad on 57th Street is Hull Gate. The building just east of Hull Gate (below in the pic) is Zoology where PCC(e) resides. Botany Pond is just outside Zoology. The water looks very blue in the picture. I think this may be an old pic. They have been replacing the roofs on all the buildings on the Quad. Zoology still has an old roof (not bright orange new slate). I think it has been replaced. There are two newer buildings on the Quad without slate roofs – Pick on University and Searle Chemistry Labs on Ellis. Spot the professor feeding ducks. Thank you for that–fascinating picture and helpful comments! Just south of the Main Quad is the Midway Plaisance – a mile long boulevard which connects Washington and Jackson Parks. All designed by Frederick Law Olmsted. Jackson Park, which borders Lake Michigan, was home to the 1893 World’s Fair and will be the home of the Obama Presidential Center. Both parks (but not the Midway) have a lot of water – ponds and lagoons. Not sure what the difference is. There are ducks in both of them. Some will eventually stop by Botany Pond. Looks like a Mallard family of ten will be heading south in the fall. 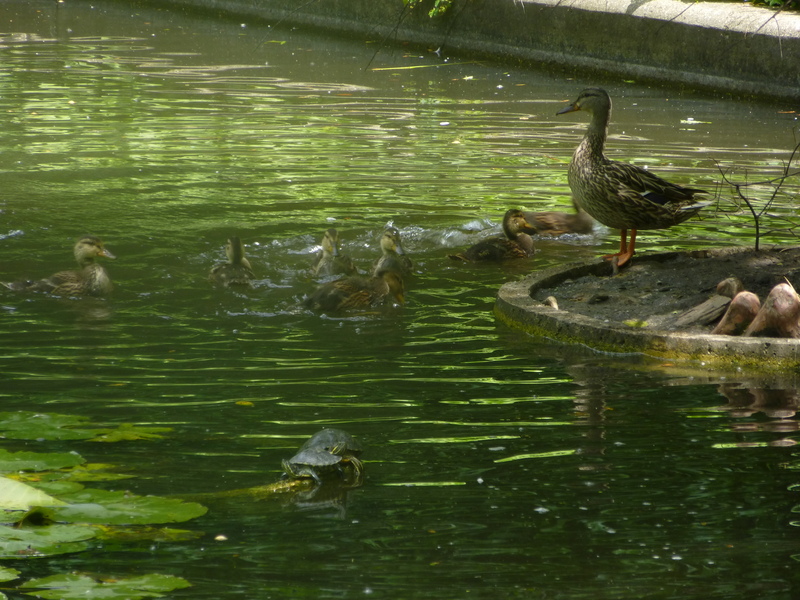 I don’t think you are step-father to ducklings any more – you have a gang of juveniles to look after. Will they ever burn their way through your stack of food now. The young ducks are almost as big as Honey! The ducklings look like they collectively outweigh Honey by ~3:1. I wonder what the actual number is. I can’t wait to see if the male offspring will have just white chests or will sport the typical brown bib of the male Mallard! 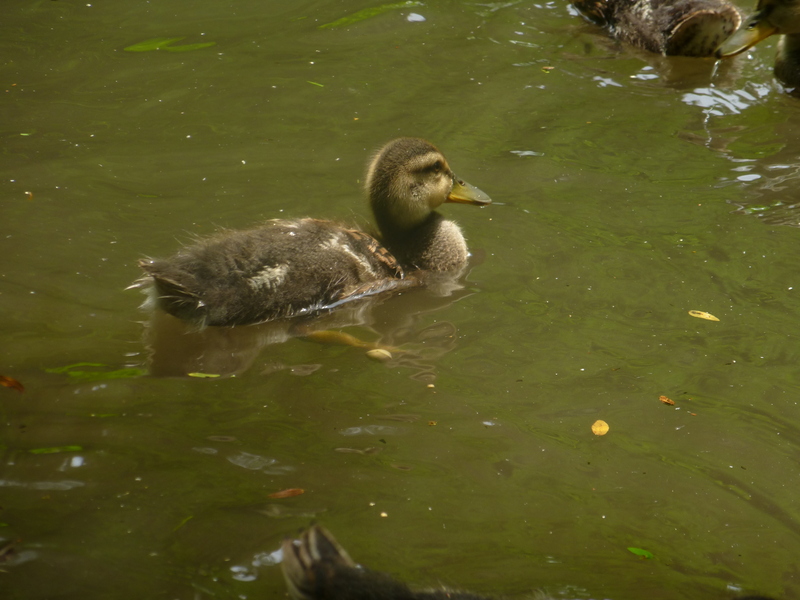 In the first photo, the two big ducklings at the rear could be males and might turn out like Frank (white chested). I think this is the first time I’ve definitely seen the young as having grown. Wow.